All I bring is questions…………The Banks crew. Regular visitors will remember the fantastic images I posted a from Jimmy Wood, Air Bomber with the Banks crew. I held back on this image, as I was a little confused by one individual in the photograph and also 2 of the signatures. 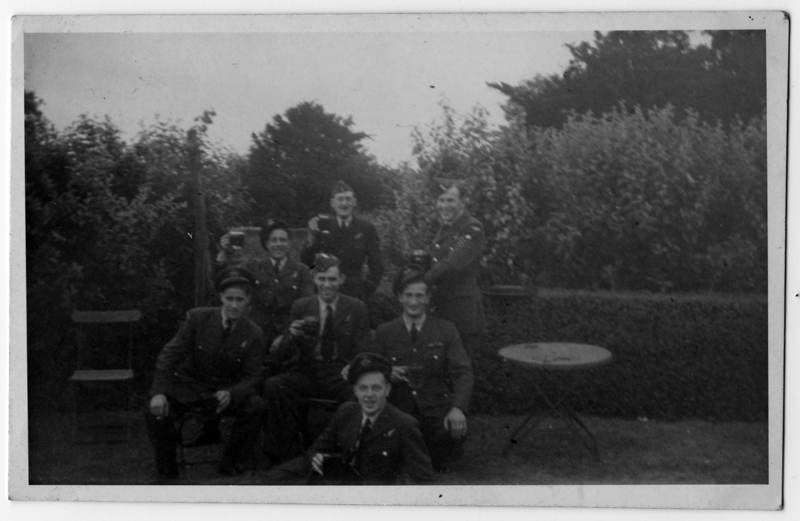 On first inspection the photograph is of the Banks crew, however on closer inspection, Alex Hirst, the Wireless Operator with the crew is missing and the fellow stood behind Jock Fraser is a mystery to me…….. The fellow on the left hand side back row is clearly the same chap stood behind Jock in the previous picture………. 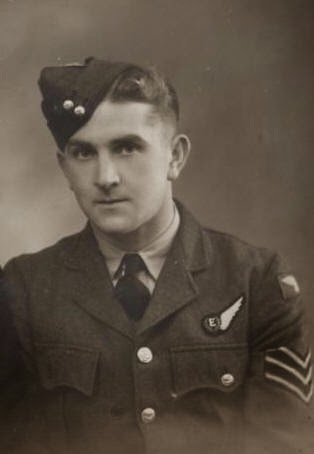 F/Sgt John Edward Barry Mossman, RNZAF NZ42112587 – Wireless Operator. Rangiuaia crew. The fact that he is a WOp like Alex makes it all the more bizarre. 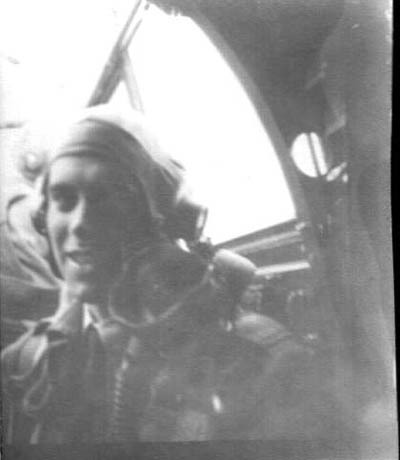 Having been through Jimmy’s logbook and the ORB’s, Alex Hirst flew every Op with the boys. This entry was posted in general and tagged 1945, 75(NZ) Squadron RAF, Alexander HIrst, Banks crew, Jack Britnall, Jimmy Wood, Jock Fraser, John Mossman, Maurice Wiggins, Mepal, Norman Allen, Rangiuaia crew, Russell Banks on July 28, 2013 by 75nzsquadron. Many thanks to Catherine for supplying these wonderful images of Maurice Wiggins, Navigator with the Banks crew in 1945. I have a keen interest in this crew, having had the pleasure spending time with both Jimmy Banks, the Air Bomber and Norman ‘Paddy’ Allen the Mid Upper Gunner. The third picture – a fantastic crew photo is a little bit of a conundrum – it shows the majority of the Banks crew – but the first individual on the back row, is clearly not. Could it be that this might be a training flight crew photo and Alex Hirst joined the crew later ???? Back row L to R: ?, Jimmy Wood, Maurice Wiggins, Russell Banks. Front Row L to R: Jock Fraser, Jack Britnall and Norman Allen. 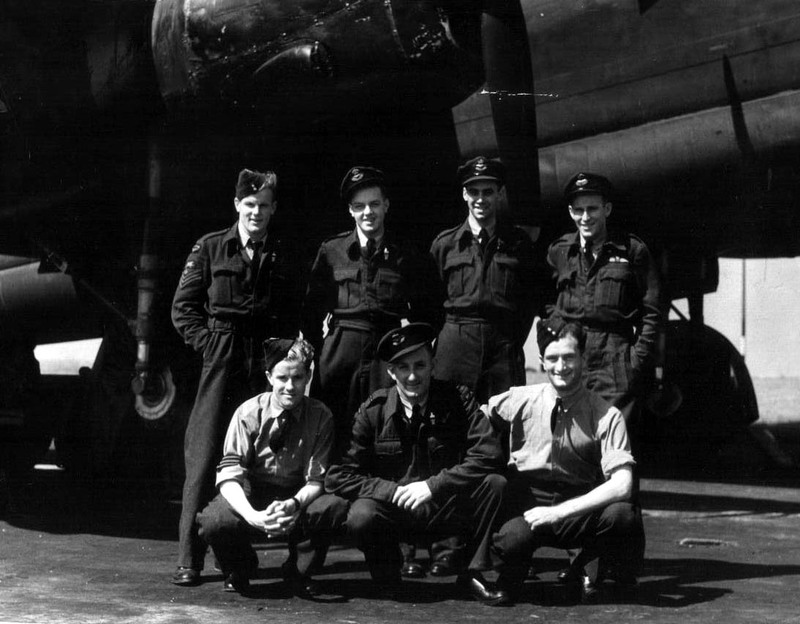 This entry was posted in general and tagged 1945, 75(NZ) Squadron RAF, Alexander HIrst, Aviation, Banks crew, Bomber Command, Jack Britnall, Jimmy Wood, Jock Fraser, Maurice Wiggins, Mepal, Norman Allen, Russell Banks, World War 2 on July 15, 2013 by 75nzsquadron. It was with great pleasure that I went down to the RAF Club today to attend Jimmy Wood’s 90th birthday celebrations with his family and relatives of his aircrew from 1945. Obviously the celebrations were a private family affair, so if I receive any photos from the day I will be happy to put them up, but I will not act on a presumption at this time. It was a lovely day and it was good to see Jimmy and his son Roger, as well as meet Barry (his elder son) for the first time after all the emails and phone calls we have had since he first got in contact with me. Jimmy was in fine form, despite what obviously must have been a long day for him, beginning at 12 o’clock at the Bomber Command Memorial just across the road from the RAF Club. 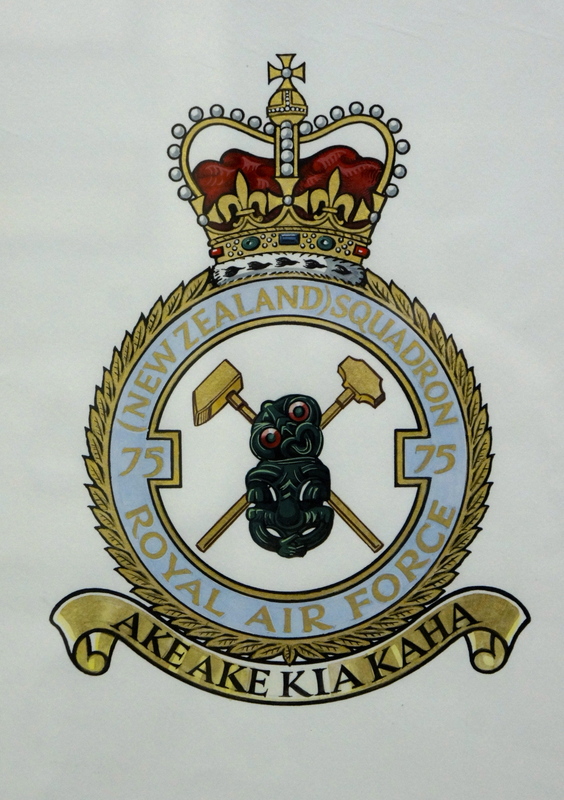 Sadly limited departure times from my village and a delay owing to snow meant that I arrived, just as the memorial service was concluding, but it was good to hear Barry shout out “Ake Ake Kia Kaha!” (the Squadron Maori motto – Forever and Ever be Strong)…….. The event also allowed me to meet again Janet, Norman Allen’s daughter and her brother Ronnie and also Jill and her husband Jim, daughter of Russell Banks, Jimmy’s pilot. Walking down the corridor out side of the Ballroom, where the birthday lunch buffet was served, I was pleased to find the 75(NZ) Squadron badge .Given that the name and badge had been gifted by the RAF to the RNZAF at the end of the war in appreciation of the sacrifices the country had made, I wasn’t sure it would be there. 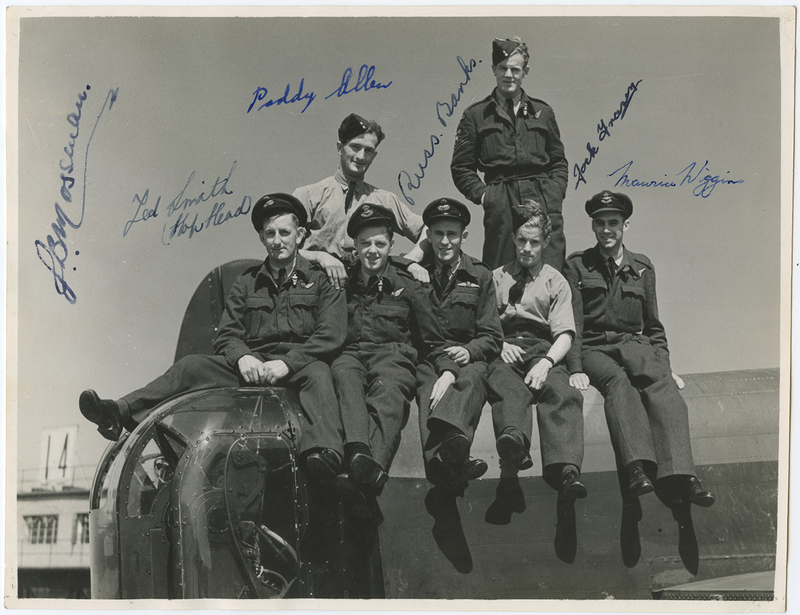 This entry was posted in general and tagged Alexander HIrst, Bomber Commabd Memorial, Jack Britnall, Jimmy Wood, Jock Fraser, Maurice Wiggins, Norman Allen, RAF Club, Russell Banks on March 24, 2013 by 75nzsquadron. “Leaving Do” – The Red Lion, Granchester, Cambridgeshire 1945. Back row, L to R: Alex Hirst, Jack Britnall, Russell Banks. Front row, L to R: Jock Fraser, Maurice Wiggins, Norman Allen (apparently wearing Russell’s jacket). Though perhaps tinged with a little sadness that they would now be split up, I think this picture captures the relief that any crew that were lucky enough to complete their tour would feel. 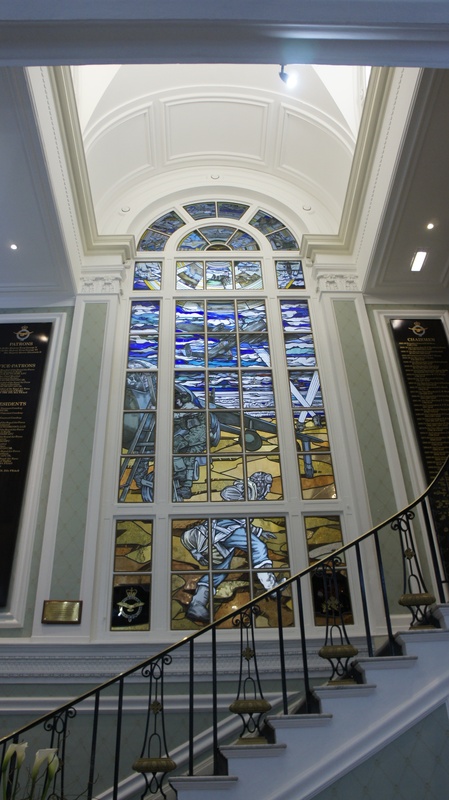 Based on the changing responsibilities of the Squadron, with the creation of ‘Tiger Force’, it could well be that Russell and Alex found themselves initially preparing to stay, only to leave after the surrender of Japan. 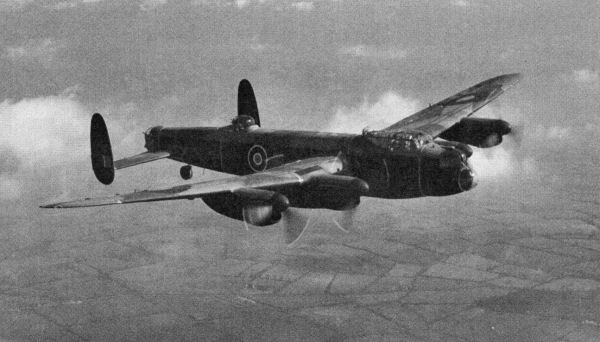 Once again, the records by this point are scant in detail and the sudden collapse of the Squadron regarding the end of the need for a bomber force for the Far East simply lists the large scale demobilisation of aircrew, rather than the specific departure of named individuals. Surprisingly perhaps, I learnt from Jack Jarmy, my father’s navigator, that as a crew, they went out only occasionally. After they had learnt they were to be screened in 1943 after 21 ops, they all went on a final trip out to Cambridge – the faces in the picture would be different, but I am sure the sentiments would have been the same.. 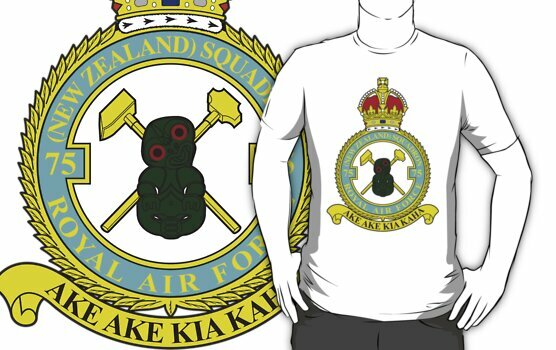 This entry was posted in general and tagged 1945, 75(NZ) Squadron RAF, Alexander HIrst, Jack Britnall, Jimmy Wood, Jock Fraser, Maurice Wiggins, Mepal, Norman Allen, Russell Banks on February 14, 2013 by 75nzsquadron. As promised, the first of no doubt a number of posts of material from JImmy Wood, Air Bomber with the Banks crew from 1945. This is a beautifully written out log book and spans the crews flights from Dreseden as their first op through to flights to view the effects of the bombing after hostilities had finished, in between the Banks crew also flew food drops to Holland and repatriation flights of Allied prisoners from Juvincourt, in France. Amusingly, and perhaps terrifyingly, in conversation with Jimmy, he recalled whilst laying in the bomb nacelle during an op he suddenly felt a painfully cold sensation between his legs. After the bombing run he got to up to discover a flak hole about 1/4 of an inch below where his ‘undercarriage’ had just been and the fragment of shrapnel buried in the front gun turret…….. 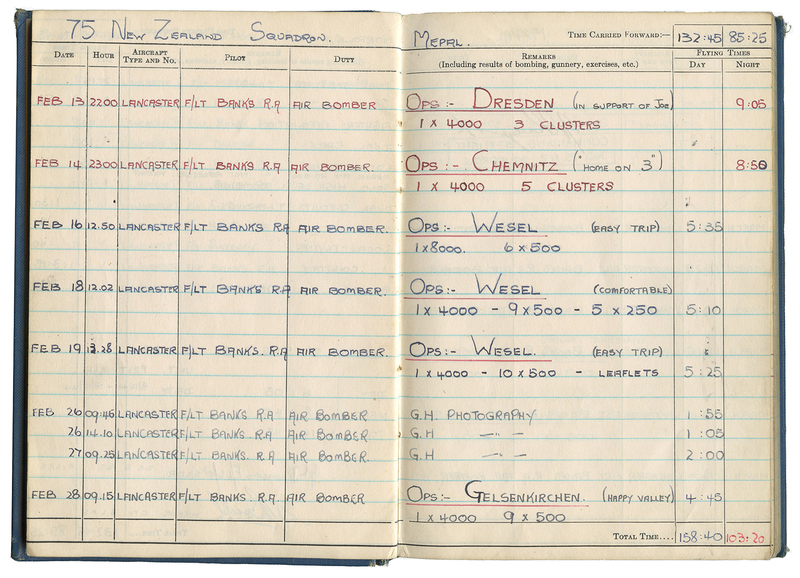 In his log book, the incident, on the 22nd April to Bremen, is simply recorded as ‘Holed’….. 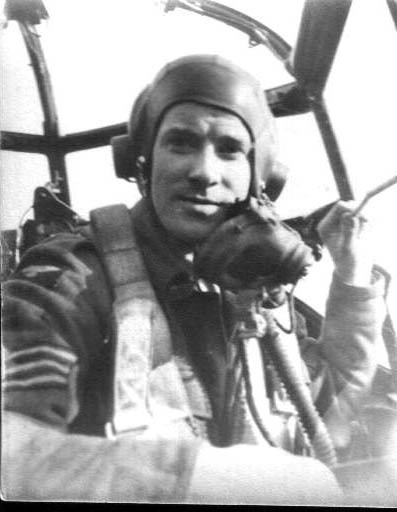 This entry was posted in general and tagged 1945, 75(NZ) Squadron RAF, Alexander HIrst, Banks crew, Jack Britnall, Jimmy Wood, Jock Fraser, logbook, Maurice Wiggins, Mepal, Norman Allen, Russell Banks on February 11, 2013 by 75nzsquadron.